This is a companion piece to the previous post. This was for another area at the same party, and I was given no boundaries other than the finished size and the fact that it must include the text "Martini Lounge". I am a big fan of classy art deco, so I decided to go that direction. Looking at it now, some two years later, I think it needs an accent color to jump out from the grays. Perhaps a bit more red, like in the olive. Sassy! 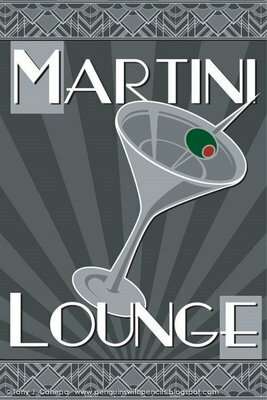 I love these Drink'n posters! Thanks Dan! Coming from a top-notch artist like yourself, that means a lot!